The brilliantly colored floral displays of Crape Myrtle trees make them remarkable standouts in the landscape in late summer through early fall. They have one of the longest lasting flower displays of any tree or shrub. Their flower petals resemble crinkled crepe-paper, hence their common names of “Crepe Flower” and “Crape Myrtle”. Individual flowers are only about one inch across, but the masses of them provide a dramatic show. Flower clusters appear at the ends of new shoots; these panicles can be 6 to 18 inches long. There are many varieties available, with flower colors ranging from white, pink, vibrant red, lavender, and purple. The Crape Myrtle is native to China and Korea, was introduced into European culture in 1759, but is now grown in all mild climate areas. Their botanical name is Lagerstroemia indica. The genus name honors the Swedish merchant Magnus von Lagerstrom; the species means “India”. 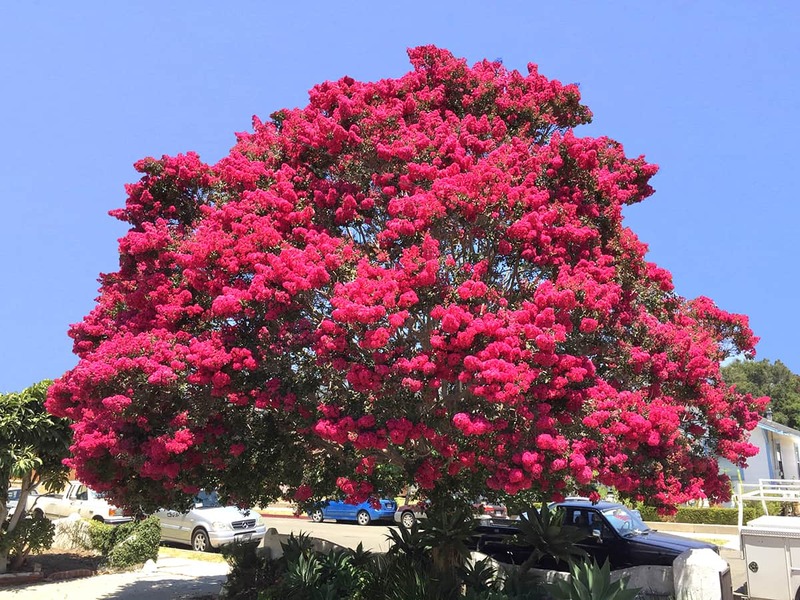 Crape Myrtles are a good choice for the Santa Barbara area, because they are drought-resistant and tolerate all types of soil. It is best to plant them in hotter areas that get full sun, because the amount of flowering is directly related to the amount of sunshine received. Mildew resistant varieties include “Tuscarora”, “Arapaho”, and “Natchez”. They grow naturally as shrubs or trees, often with multi-stemmed trunks, but can be trained into trees with a single trunk. Depending on the variety and training, they grow to 15 to 30 feet in height with a 15 to 20 foot spread. The glossy, dark green, oval leaves are 2 to 4 in length and provide stunning fall colors in various shades of red, yellow and orange. Their attractive bark is smooth – displaying a mottled pattern of tan, gray, brown, cinnamon and soft pink that can be enjoyed all year long, especially in winter when the tree is leafless. This easy-to-grow tree will reward you with a delightful display of flowers, leaves, and bark all year round! 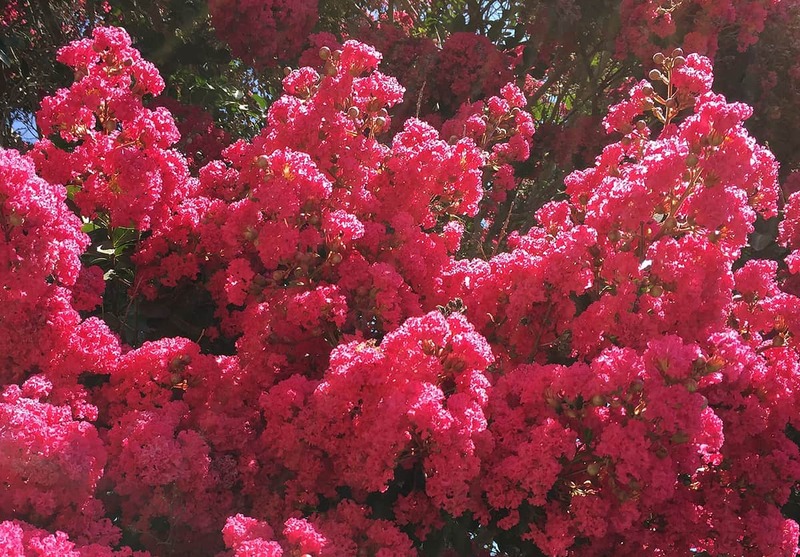 Mature Crape Myrtles can be seen in the 400 block of San Roque Road, the 300 block of West Alamar, the 700 and 800 blocks of West Carrillo Street, and the 3600 Block of State Street. Young trees are in the 700 and 800 blocks of East Canon Perdido Street.